As you all know, I had the privilege to go to Normandy, France a week or so ago. My Army Reserve training came up, and surprise! I got this great opportunity! Pretty awesome if you ask me. Besides the non-stop working and the military craziness I had to put up with, I had a blast. To be where so many heroes shined, to walk where so many heroes died, and to honor those still alive today; it was awesome. 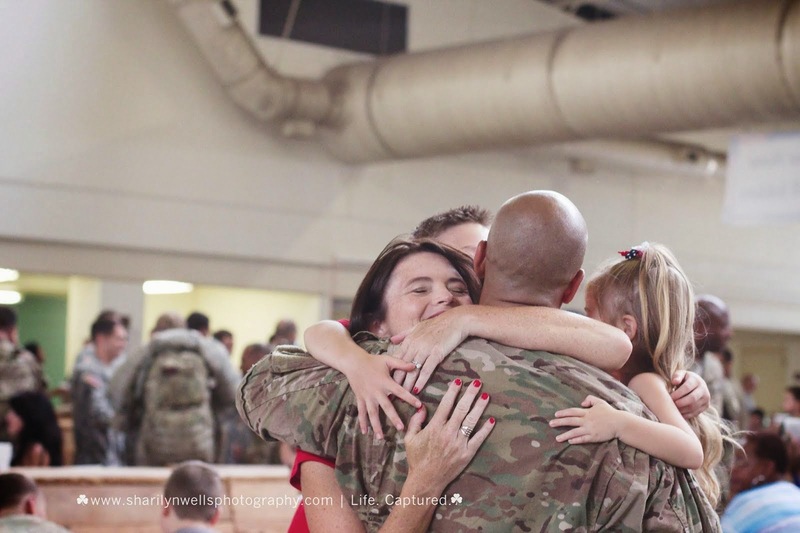 I met so many wonderful veterans with incredible stories, I feel as though I need to share with you. And apparently, I'm an ol' veteran magnet. I just wanted to shake their hands and thank them, they would hug me and wrap their arm around me and try to take me away! I love these stories that I'm about to share! So, grab your coffee, sit back and be prepared to be amazed! (All [with the exception of one] photos are U.S. Army Photos by (yours truly) Staff Sgt. Sharilyn Wells. They are not considered SWP, LLC and are free for use to the public. No copyrights are on these photos. But if you use, please give me credit). Happy paratroopers on the flowery field of Salisbury Glen! This is Curtis Phillips. Look at his hat, sure tells a story right? Curtis is a D-Day veteran with the 1st Battalion, 2nd Infantry, listens to a speaker during a memorial ceremony at Picauville, France, June 1. Another WWII hero and Purple Heart recipient, Tech Sgt. Milt Staley, from the 359th Regiment, 3rd Battalion, 90th Division, salutes during a memorial ceremony at Picauville, France. The bodies of thousands of U.S. Soldiers lay at peace at the Normandy American Cemetery and Memorial, overlooking Omaha Beach. This photo and the two above are from the German Cemetery. See how the dark stone subdues the grave makers? And how dark their cemetery is compared to the American Cemetery? It's like the Germans are still remorseful for what happened 68 years ago. I absolutely loved this cemetery, I was digging the dark stone and to see the ceremony there with German soldiers ... just awesome. Colleen Clancy shows off her father's combat airborne wings while visiting Utah Beach, France, June 2. Clancy's father, John Clancy, was a medic with the 505th Parachute Infantry Regiment, the only unit to participate in four combat jumps during WWII — Sicily Italy, D-Day, Market Garden, and the Battle of the Bulge. This photo tells so much! It was such an honor to talk with Colleen and hear her stories about her father. To think, he went through all that to die of lung cancer 3 years ago due to smoking. Crazy. Staff Sgt. (Ret.) Duane (Pinky) Pinkston talks with U.S. Soldiers of Task Force 68 at Utah Beach, France, June 2. Pinky, was a medic in the 82nd Division during WWII. Pinky, what a guy. He served with Colleen's dad and she even shared a photo of the two of them during the war. Pinky even gave me a picture of him in his uniform. Absolutely awesome. (U.S. Army photo by Sgt. 1st Class Malachi J. 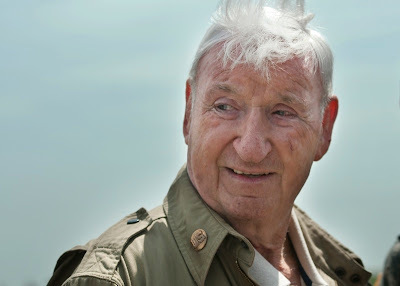 Fields) Major Jack Port a veteran of World War II stormed Omaha Beach with the 4th Infantry Division on June 6, 1944 speaks to U.S. Army and British Paratroopers from various airborne units as they visit Pointe Du Hoc during the 68th anniversary of the D-Day invasion, Normandy, France, May 31, 2012. Jack Port was amazing. He was the first vet we ran into (I know bad order of photos), but he was. He just captivated everyone when he told his story of Utah beach. And when I thanked him, he said, "It's an honor and thank you for your service." I mean really? Here's a true hero and he's thanking me! I was blown away. This should be a familiar face for all you Fort Bragg people! Here's the original Iron Mike on the La Fiere fields where hundreds of paratroopers jumped, or intended to jump, onto just before the storming of the beaches. Some paratroopers were more than 20 miles of their mark and landing in the small town of Ste. Mere-Elgise. He is a little shorter and skinnier than our statue here on Fort Bragg ... and a little younger, but with all American things, we go big or go home! The whole mission of the trip was for our paratroopers to jump onto La Fiere to commemorate the airborne operations on D-Day, 1944. But with the winds gusting over the recommended 14 knots, only a few got out of the birds. Some of the guys got hurt and some were bummed about not jumping, but all were in awe when they saw the parachutes in the sky. 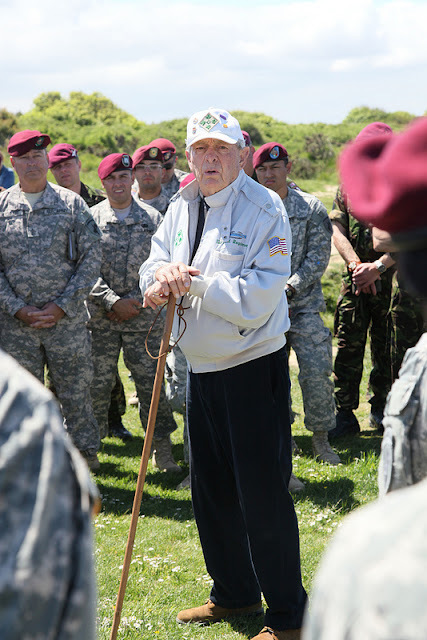 D-Day veteran, John Perozzi, 82nd Airborne Division, talks with active duty 82nd Abn. Div. Soldiers after a ceremony that commemorated the La Fiere, Ste. Mere Eglise, WWII and D-Day events, June 3. Mr. Perozzi was honored in a ceremony on La Fiere. He received the French Merit of Honor ... super cool. He's family was holding him the whole time, he looked frail and weak, but the second 82nd Abn. Div. paratroopers circled him, he was just as feisty and funny as I'm sure he was back in the day. He was one of the vets who spotted me in a sea of men and grabbed me and hugged me. This little boy kept staring at me as I tried to get his picture. How cute is he? He's gonna be a good looking man when he grows up! He's dressed in WWII garb ... no joke, everyone at Ste. Mere-Eglise was dressed up in either military WWII garb or 1940's garb. It was like the town stepped back in time. It was incredible! The 4th Para, The Royal Parachute Regiment, are British soldiers from Task Force 68 stand in formation during a D-Day commemorative ceremony, June 5. Everywhere we went, the British were with us. It was great to share this journey with the 4th Para. They were hilarious and briefed us on some of the battlefields in which England had a role in during WWII. We made some great friendships. These two ladies have to be my favorite veterans that I met. They are so cute and tiny (literally, they're like 4 feet tall). This bouquet was from one of the many ceremonies I attended. It was the Germans' bouquet. Pretty right? I HAD to snap a picture. Sgt. Major Michael Kreiberg, U.S. Army Civil Affairs and Psychological Operations Command (Airborne), marches Task Force 68 through the streets of Carentan France, June 4.What a backdrop right?! Fred Morgan, D-Day veteran who was with the 82nd Airborne Division as a medic during WWII, talks with active duty Soldiers about his experiences in the war. One story that was shared was when he was helping a fellow Soldier on the battlefield and a Nazi tank rolled up on them. "I thought for sure we were dead," said Moragan. "But he popped his head out, looked at me, looked at (the injured Soldier), and went back inside and continued on his way." Morgan, who was a staff sergeant in the war, was later commissioned. He got out of the Army and joined the Air Force, retiring as a lieutenant colonel. He is 90 years old. On June 6, Task Force 68 walked through the battle fields of La Fiere and learned about the heroic acts of the men who captured the bridge of La Fiere, ultimately allowing for the landings of the beaches of Normandy to succeed. WWII veterans run into to each other at the Iron Mike statue on the La Fiere battlefield on June 6. Here, they are teasing Henry "Duke" Boswell, 505th Parachute Infantry Regiment, bottom left, for being the "baby" of the group at age 86. I absolutely loved seeing these guys meet. Every time a bunch of vets got together the first 3 questions asked were, "Who were you with?" "Where were you?" and "How old are you?" LOL, I loved it. These guys were a hoot and the man (I can't believe I forgot his last name) in the blue jacket and baseball hat, Dave, tried to take me home. Too funny. I love these guys. 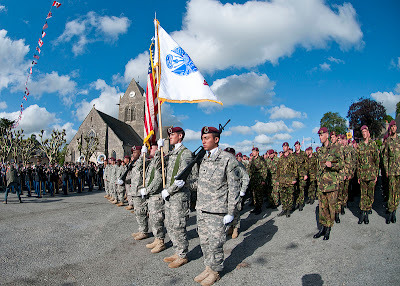 Task Force 68 Soldiers attended a memorial ceremony for D-Day veterans in Hermanville, France, June 6. Even with pouring rain, the Soldiers paid their respects to the heroes of WWII.Task Force 68, which is made up of paratroopers from the U.S., Germany, France, Holland, and the United Kingdom, is in Normandy, France to commemorate the 68th annivesary of D-Day. WWII veterans try to cover themselves as a sporatic downpour happens in the middle of a memorial ceremony in honor of them and their fellow Soldiers' sacrifices during WWII. 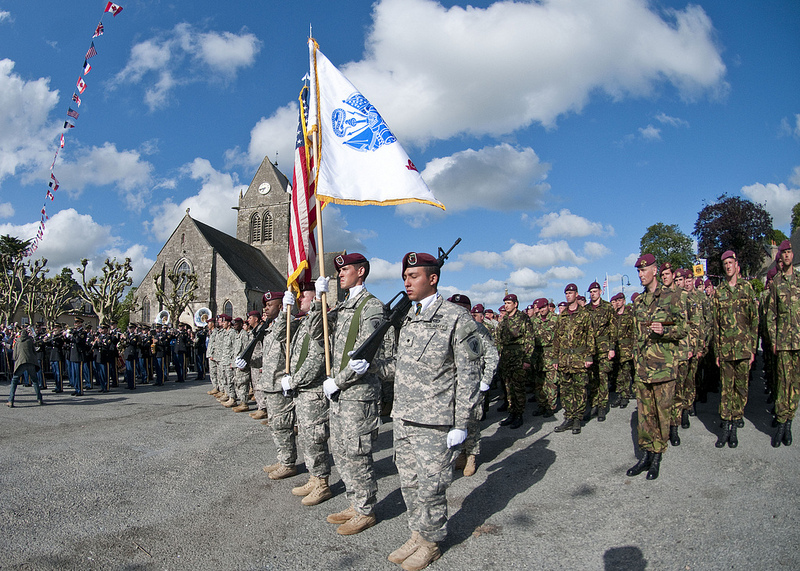 Task Force 68 Soldiers attended a memorial ceremony for D-Day veterans in Hermanville, France, June 6. I'm going to end with this photo because it has a lot of meaning. Through rain and cold weather, our soldiers stood proud because through rain and cold weather, our soldier 68 years ago gave their all to help a country at war. A lot of good men died on the shores, the fields and the towns of Normandy, but the gratitude that is given to our guys, it's amazing. These are great! I have goosebumps looking at them and reading the stories you are retelling. Amazing opportunity! Great photos and stories...must have been truly amazing to have been there! Nicely done!! If I might rectify one of the things I read while looking for pictures of the veteran Jack Port: he landed on Utah Beach (not Omaha) on June 1944, you're correct about the 4th Inf Div but not the place where he landed. Thank you for your contribution though!